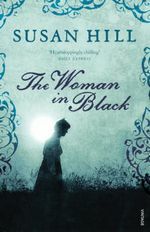 I have been curious to read The Woman in Black for some time. I’m not sure exactly why, except that the title made me curious (did it have anything to do with The Woman in White?) and I had heard that it was a really good example of a ghost story. I finally picked it up when I was in London in the summer, and I proposed it for my local book group for our October selection, figuring if there is a time for ghost stories, round about Hallowe’en is it! We met to discuss it this week, on an appropriately dark and drizzly night. As we drove briskly across the absolutely flat countryside, I saw scarely a tree, but the hedgerows were dark and twiggy and low, and the earth that had been ploughed was at first a rich mole-brown, in straight furrows. But, gradually, soil gave way to rough grass and I began to see dykes and ditches filled with water, and then we were approaching the marshes themselves. They lay silent, still and shining under the November sky, and they seemed to stretch in every direction, as far as I can see, and to merge without a break into the waters of the estuary, and the line of the horizon. I think I must have fallen asleep only a few moments after putting the lamp out and slept quite deeply too, for when I awoke – or was awakened – very suddenly, I felt somewhat stunned, uncertain, for a second or two, where I was and why. I saw that it was quite dark but once my eyes were fully focused I saw the moonlight coming in through the windows, for I had left the rather heavy, thick-looking curtains undrawn and the window slightly ajar. The moon fell upon the embroidered counterpane and on the dark wood of wardrobe and chest and mirror with a cold but rather beautiful light, and I thought that I would get out of bed and look at the marshes and the estuary from the window. At first, all seemed very quiet, very still, and I wondered why I had awoken. Then, with a missed heart-beat, I realized that Spider was up and standing at the door. Every hair on her body was on end, her ears were pricked, her tail erect, the whole of her tense, as if ready to spring. And she was emitting a soft, low growl from deep in her throat. I sat up paralysed, frozen in bed, conscious only of the dog and of the prickling of my own skin and of what suddenly seemed a different kind of silence, ominous and dreadful. And then, from somewhere within the depths of the house – but somewhere not very far from the room in which I was – I heard a noise. I liked the dog especially, and I was quite upset when … well, you’ll have to find out for yourself how the dog fares. But if in these ways the book is well written, in others it really disappointed. One thing that bothered me was the heavy-handed foreshadowing, which seemed like an unnecessary and artificial way to create suspense. Another was the imbalance between the parts: the set-up is long and not really very interesting (and full of that heavy-handed foreshadowing), then the ghost story, which is told as a reminiscence, kind of staggers along, with fits and starts of ghostly business rather than the gradual development of irresistible eeriness. And then there’s a dénouement which is clearly meant to be the climax of the horror but which struck us all, I think, as too sudden and unmotivated: why would the ghost do that? What did Arthur Kipps ever do to her? And that brings me to our main objection, which was that the ghost story itself was not very good. The haunting may be well described, but it isn’t well motivated: its specific cause is fairly predictable, if not from the outset, than from the earliest hints, and the ghost’s malevolence seemed disproportionate and random. Why should everyone suffer for such a particular tragedy, and a tragedy for which nobody is really strongly to blame? We brainstormed a bunch of alternative twists that we thought would have built the plot up into something more original and surprising, and one that would have made more of the characters more involved–Arthur Kipps especially. There should have been more information in the documents, more cruelty in the history, and some specific unfinished business that brought the ghost back to Eel Marsh House. The book seemed more special effects than anything else–there’s no compelling aboutness to it–which is probably why we agreed that while it’s not a great book, it will probably make a pretty decent film (and indeed, the trailer looks good, for people who like that sort of thing, though judging from what it shows, the screenwriters have added a lot of new elements). If you are looking for a ghostly read yourself, I’d recommend Elizabeth Gaskell’s The Old Nurse’s Story instead. Or, of course, The Turn of the Screw. Or The Little Stranger. I actually left our group discussion feeling less satisfied with The Woman in Black than when I arrived, and I don’t really understand why it has the ‘contemporary classic’ standing it does. Next Article This Week in My Classes: Mid-Term Madness! Your reaction to the book is a lot like my reaction to the play. The haunting is nice and creepy, and the lengthy build-up and heavy foreshadowing actually work pretty well on stage, but it took so long that I was expecting more from the actual climax. In the end, it was more about the startles than the kind of horror that gets under your skin. The ghost’s story just didn’t stick with me at all, though I do remember being nonplussed by it.